and dog dish, but love the look of the Magnums. Welcome from Iowa. Nice looking car. I like the dog dish myself. (12-03-2018, 03:34 PM)73pony Wrote: Welcome from Iowa. Nice looking car. I like the dog dish myself. What's the rush? Wait until you find something you like that fits properly. Dog dish with trim rings are nice, or even dog dishes on black wheels. Agree with other posts! Leave the caps and rings!!! They look great. You will run across some better Magnums later. Personally, I really like the look of your car like it is. IMHO too many change and run Magnums. (12-03-2018, 08:28 PM)Boss1Ray Wrote: Agree with other posts! Leave the caps and rings!!! They look great. You will run across some better Magnums later. Personally, I really like the look of your car like it is. IMHO too many change and run Magnums. Hello from Mississippi. 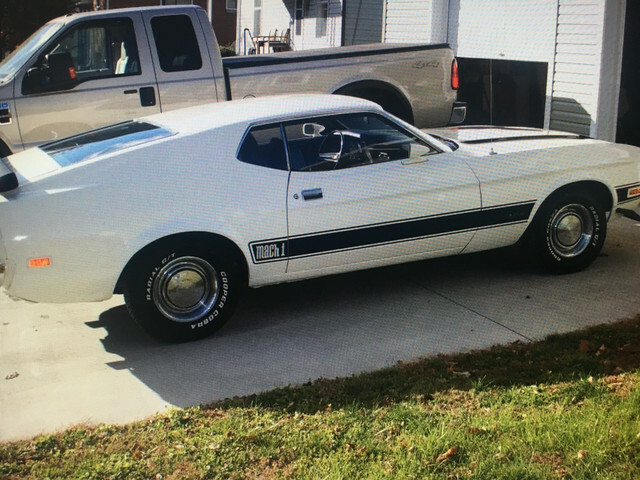 You have certainly acquired a nice looking Mach1. Surprised to hear the 14" Magnums would not clear your calipers. With the exception of some 65-66 Shelbys, the 14" Magnum was not production installed until the 72 Gran Torino started down the assembly line. Since disc brakes were standard on the 72/ Gran Torino, the wheels are caliper friendly. The chrome non trim ring version was used from 72-74 and are plentiful and an easy find. I have seen a lot of them used on 65-73 Mustangs with no problems. The same disc brake caliper was used from 1968-73 on the Mustang with the majority of those cars equipped the 14" rim. Is it possible the one you tried could have been a Chrysler Magnum wheel with some differences on the inside of the rim? The 14" Ford Magnum rim would have one the following ID #'s..D2OA-JA, LA, LB, D3OA-BA, BB, or D4OA-AA. 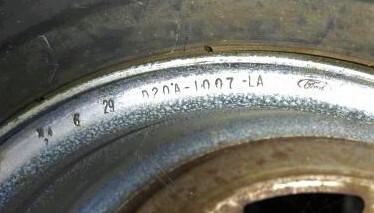 Those numbers can be found on the reverse side of the rim near the rim flange area. As others have posted, I would keep the trim rings and hub caps and search for some 15 x 7" Magnums if that is the wheel you desire. There was no standard or optional 15" wheel production installed at the assembly plant for the 73 Mustang. Seems strange to that say the trim ring/hub cap now is a desirable look. Back "In The Day" those were the first things to get thrown away in favor of the Keystone-Cragar S/S look everyone wanted. And....by the way, Welcome to your Mustang Home. If I could figure out a way to run 17 or 18” steel wheels with dog dish I would be all over that. I love that look.